That quote from Oscar Wilde hovered around as I considered writing an account of how I came to make this dessert. I was recently invited to a ‘Chef’s Masterclass with Head Chef, George Blogg’, held in the Tithe Barn at Kingscote Vineyard. Chef and his team had re-located there to offer day courses of instruction, participation, cooking, eating, drinking and so much more which I will try to describe elsewhere. It suffices to say that any expectations which I had formed were made to seem daftly inadequate. These days were rare (perhaps not to be repeated) ventures organised while Gravetye Manor is closed until an exciting re-opening in early May. I should have known by now that any Gravetye offering is guaranteed to rest on professional excellence and care which leads to enjoyment and deep satisfaction wherever it might be held. We eventually sat down to eat a five course meal prepared through the day. One of the two desserts is the recipe which I was inspired to reproduce soon after returning home. This is where I ask you to do some work before you start cooking. An internet search of this sort will give you recipes for the milk and eggs. There are processes for other elements here which were new to me but in the main this plate rests on a gentle approach using reasonably well-known things which work together. So, I'll try to inspire you to those great things... but be prepared to research the wealth of information available which will flesh out the gaps I leave here. Just yolks needed to start. The current series of MasterChef UK provided a reminder for me to deal with the whites by poaching them as fluffy 'Îles flottantes'. And then Catch-22 kicks in as I'd want more yolks for the custard... hrrrgh. Flaked almonds could be toasted further than mine but beware of taking them into bitterness. Start again if that happens. The almonds join heated cream and almond milk to infuse. Half an hour minimum. I would recommend half a day at least. Optional Amaretto after cooling. Yes, I did take that option. A little vanilla extract is worth considering. The base of moulds are cling-filmed, foiled and placed on a J-Cloth to protect from direct heat. Sugar and those egg yolks have joined the mix and it's ready for pouring. I lightly tap such liquids to get rid of surface air bubbles but at Gravetye they give a quick sweep from a blow torch and all is smooth. Thank you, Chef... you have the best 'wrinkles'. The whole tray is cling-filmed and goes into an oven no higher than 90 degrees C until the tops have a firm wobble. Any higher and you risk cooking the yolks into lumpiness. Rhubarb can be prepared while the 'custards' are baking. This is some from our garden but I only used it for skin peelings to colour the gel syrup. Younger, pinker, more tender rhubarb came, via supermarket, from Norfolk. The stripped skins are boiled in sugar syrup to release their colour. The strained syrup is heated again. The peeled rhubarb is added and everything is just left to cool down. Carefully lifting out the rhubarb, the syrup is boiled with agar agar until that is completely dissolved. I used flakes of agar agar. If yours also turns out like wallpaper paste like mine did the first time, you've put in too much setting agent. Make sure you have reserved some pink syrup to dilute! I ordered an oven thermometer after cooking the 'custards' for at least double the time and realising that I was well under the maximum 90 degrees required. And that cling film is a bit of a cheat. It was forgotten for the baking but I wrapped it round for cooling. No harm done as it turned out. The penultimate task (before finding the proof in the eating) is to plate up. I had sketched a few ideas but decided to try a similar arrangement to that of the Gravetye team. Bear in mind that we were treated to a second dessert there so this picture from the day shows what was more of tasting menu proportions. 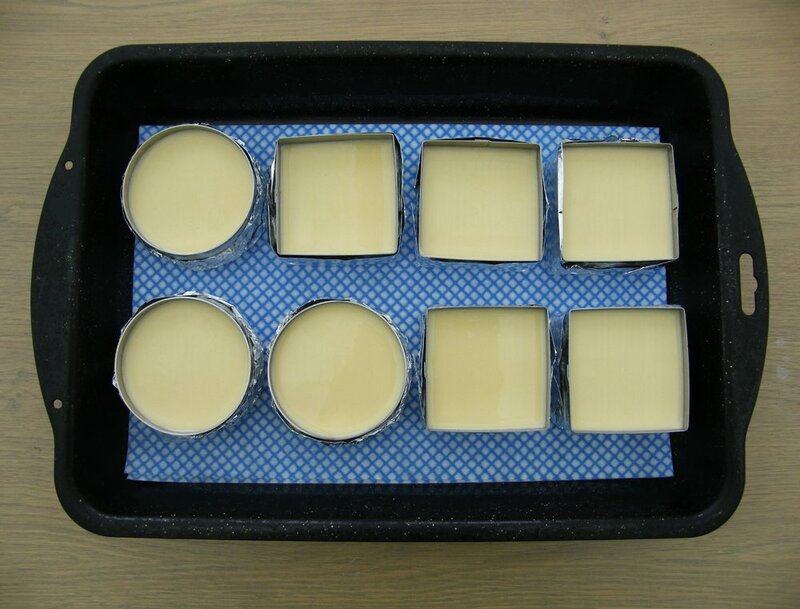 A scattering of demerara sugar over the custard is caramelised by blow torch. 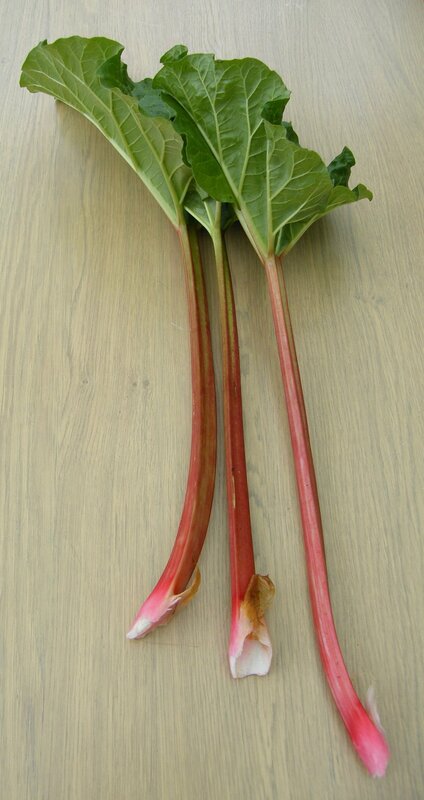 My lighter pink rhubarb is prepared after Gravetye's suggestion but I had some darker to add from our breakfast poaching. Thinking I would simply extend the fruit (I know... vegetable!) on each side, I found a 'pinwheel' forming instead. I couldn't go with any more symmetry so the gel and toasted almonds were placed to break up visual regularity. As Chef Blogg advises, a careful, close confusion of all elements ensures that they are easily tasted together wherever the spoon investigates. A careful look at those flowers reveals that something in the garden has had a go at the top petals... so don't look too carefully! The square mould was plated up on a rectangular plate. Mint leaves were for visual effect only. The red-veined sorrel used at Gravetye was more appropriate but I really wanted to have that pop of green captured somehow by my camera at home. My efforts were made in time to serve after an Easter Sunday roast lamb dinner with an invited neighbour. Her reaction at setting eyes on her pudding was all delight... she was delighted and her reaction was delightful. Something like the squeal of a pet guinea pig when it hears the clink of its food bowl. Something like that. The photographs in this post are supplemented by a few more taken along the way which can be viewed in an album here. One last thing to address. That Oscar Wilde quote. I wasn't aware until checking that he added a few more words to complete it. Oh dear. I really must deal with that. I'll readily agree that I am imitating greatness. And I am perfectly happy flattering that greatness since I also continue to address sincere thanks in public and private to the source of that greatness. Which just leaves my mediocrity. In this particular instance, I'm looking at what I managed to achieve and for once I've decided that I might have pushed on as far as 'not half bad'. Getting there was made easier of course because, in the slightly modified words of renowned cook and part-time scientific revolutionary, Sir Isaac Newton, I was "... standing on the shoulders of culinary giants". Thanks again to Chef Blogg and his brilliant brigade.